The CBG Procrastination: A Tale in Open G | Robert Mitchell Jr.
← Today’s WOD, and What About Yesterday? I believe that when you have lots to get done you should dive in and pick the low hanging fruit first, make a plan, and tackle the rest in an organized fashion. I’m not a procrastinator. And yet, I kept putting off building my cigar box guitar. Don’t know why. My guess is that I was subconsciously fearful of my ability to learn to the play the darned the thing or, more likely, I knew subconsciously that once I had it I would never put it down. See, that’s the footnote to this sad tale of procrastination. I am not a very good guitar player. And if there’s one thing I’m not good at, it’s not being good at things. It’s a curse, a tic, a compulsion. I cannot do anything halfway. I cannot muck around. When you’re a dog like me, everything looks like a bone. Nothing to be afraid of though. As instruments go, this should be one of the easiest. She’s just three strings wide and tuned in Open G. Has to be easier than playing a regular guitar, right? Walking blues, here I come. Here’s a shout-out to Andrew. Andrew’s a cool guy with a sweet blog. I’m not half the craftsman he is, but I know he’ll get a kick out of this build. You should check out some of the incredible stuff he has built. Anyway, here she is. Before you start complementing me on all that pearl inlay and fret work, I can’t take credit for that. I bought a finished neck on eBay that had the pickups already installed. All I had to do was get a cigar box, find some instructions online, and source the hardware. All I gotta do now is play regularly and not obsess. 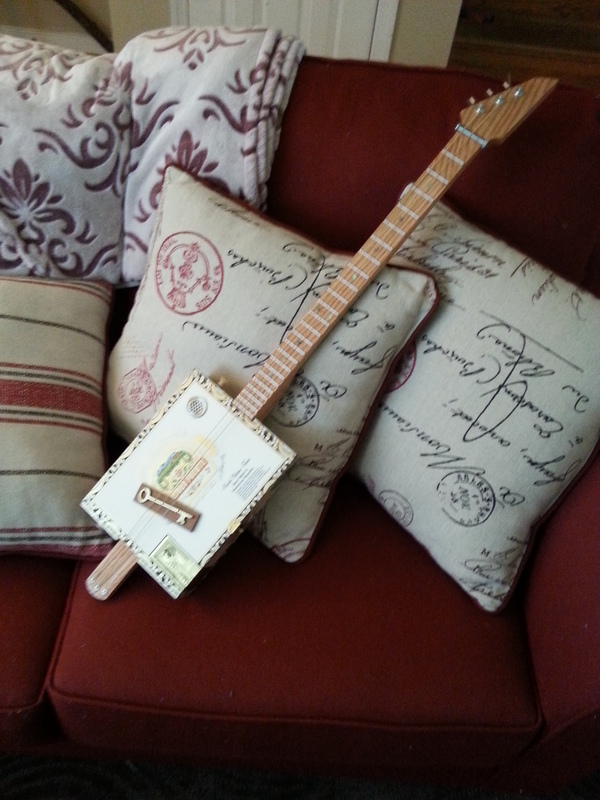 This entry was posted in Mysticism, Writing and tagged cigar box guitar, craftmanship. Bookmark the permalink. What do you feel you learned about Making in the process of making this? I’ve made many things, some beautiful, some functional, and a few, like this one, both. But this one is the most beautiful because it touches all five senses, and most functional because it holds the promise of learning a new skill. It feels like I made a doorway or discovered a new dimension. And yet the build wasn’t incredibly hard! So I’m learning that Art and Craftsmanship are even more powerful and nuanced than I realized. And there is so much more to do and learn! Pingback: Shocked and Flattered (and a 30-Minute MMA Tabata) | Robert Mitchell Jr. Thanks Phil! When I was a kid I aspired to be a polymath in the mold of Jefferson, Franklin, and Samuel Taylor Coleridge. Even went to Jefferson’s University. Never quite hit the mark. But then, neither did I turn out to be a slave-owning member of the landed gentry or an opium eater. So there’s some comfort in that!